It has now been almost two months since we walked in Sweden the Kungsleden trail. Afterwards we enjoyed festivals, a two-week holiday in the French department of the Lot, the kids went to camp and we at restaurant … life was beautiful and the pointer of the scales tipped slowly. Time to pick the hiking boots back up and going out. A rare weekend we had with the two of us and not had to work, we used to hike the French Opal Coast. We jumped at 6am Saturday morning from our bed. Well, I jumped out. Hannelore, my ex-girlfriend, limited the first half hour of the morning to some mumbling and disbelief that she has to get up early on a free weekend. But after a refreshing shower and coffee, we set off to the Opal Coast. After good 2.5 hour drive we arrive at our destination. Or at least our starting point, our final destination was 30 kilometers away just past the fishing village of Wimereux, near Boulogne-sur-mer. Wissant has been a fishing village for a millennium: along with Audresselles it is the last fishing village in France to use a traditional method of fishing using a wooden boat called a flobart and was in the Middle Ages a major port for embarkation for England. The village is mentioned in “La Divina Commedia” of Dante, though there is some debate about where the town ‘Guizzante’ is located precisely. The village is also celebrated in the The Song of Roland, one of the oldest Middle Dutch chivalric romances. We eat there a part of our picnic, and moved on. We walk through the dunes and on the beach on to the headland called ‘Cap Gris Nez’. This part of France is the closest to the UK. The name of the cape is Old Dutch originating ‘nez’ which refers to the Old Dutch nesa a protruding piece of land in the sea. In 1805, Napoleon Bonaparte had installed a semaphore here which was the first of a new line that would connect France with England, he hoped to win soon. Even in the Second World War there was established a role for the cape. The vicinity of the many bunkers, ‘casemates’ and the ‘Musée du Mur de l’Atlantique’ are witnessing this. The temperature begins to rise, we climb up and take a second stop to eat something right after the lighthouse. By beautiful weather the sea looks more like a view of the Cote d’Azur than a northern French seaside resort. Along a beautiful coastal path we continued towards Audresselles. The temperature is reaching its peak and the sweat pours down our heads. On the beach of Audresselles we can not hold it anymore. Backpack on the side and we dive into the sea, delicious! The temperature is reaching its peak and the sweat pours down our heads. After a refreshing swim we walk further to Ambleteuse where we once again embark for a dive. Eventually we arrive in Wimereux, a village of 7500 inhabitants. We do some shopping and walk out of the village. Between Wimereux and Boulogne-sur-mer is our destination. We slept at the campsite l’Ete Indien, so beautifully sung by Joe Dassin (not the campground but the late summer phenomenon). We had a few weeks earlier booked a cabin. A wooden cabin with a bed in it. Actually, the idea was to book an Indian teepee but they were already full. I will once again have to come back with my squaw. It was a four-star campsite so there was a nice pool and all the amenities were fine. We ate there, after a refreshing shower, a good meal at a reasonable price. We slept great and after some breakfast we walked back to the ‘Cap’. On the topographical map we were looking for an alternative way so we hadn’t to do the same route as the day before. Slightly above Ambleteuse we picked up on the GRP 120 bike trail and followed it with some adjustments to Wissant. We walked through the hinterland by beautiful nature, dunes, past farms, pastures and mown fields, … towards the coast. The weather was completely turned, there was a strong wind in the back and we even got a heavy downpour just as we were enjoying some baguette with Camembert. Despite or because of this weather we saw the English cliffs now very clearly on the higher landscape. Something beyond Wissant I was inattentive and we did not pierce through the dunes and had to walk 2km along a busy road. We finally got back on the beach strolled to the with cliffs. We walked along the beach majestic cliffs instead of on it. One last final climb and we arrived at the car, 38 walking miles on the meter. The mileage, shifting dune sand, rocky beaches … but especially the weather made quite a difficult tour of it. We were happy to be back, but looked back on a nice two days with beautiful and varied landscapes. We drove 2.5 hours from Meerhout to Calais. By public transport you can get to Calais. From Antwerp it’s a 4 to 5 hours to travel to Calais. Look at http://be.voyages-sncf.com/nl/ for schedules. With bus 05 it’s 45 min from Calais to the car parc at the start of this trip, there’s a foot path along the coast that brings you to the Cap in two hour (11.7 km). 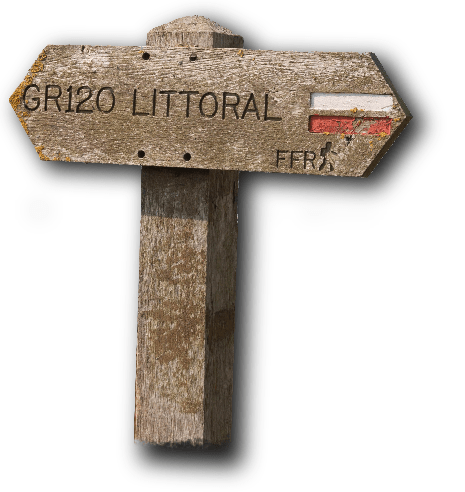 There are several ‘Grand Routes’ trails in the region including the GR 120. The Via Francigena (a to-do on the bucket list) between 586Canterburry and Rome and the European trail E9 also run on the route. We took the Topographic Map 1: 25000 of the ‘IGN Institut National Geographique’,’Calais, Site des Caps – Foret de Guines’. We followed on day 1, the GR 120 that runs along the coast and dunes. Day 2 we walked on parts of the GRP 120, a small piece of GR 120 and with the help of the card. There are several campsites and hotels on the route. We camped between Wimereux and Boulogne-sur-mer on camping ‘Eté Indien’. 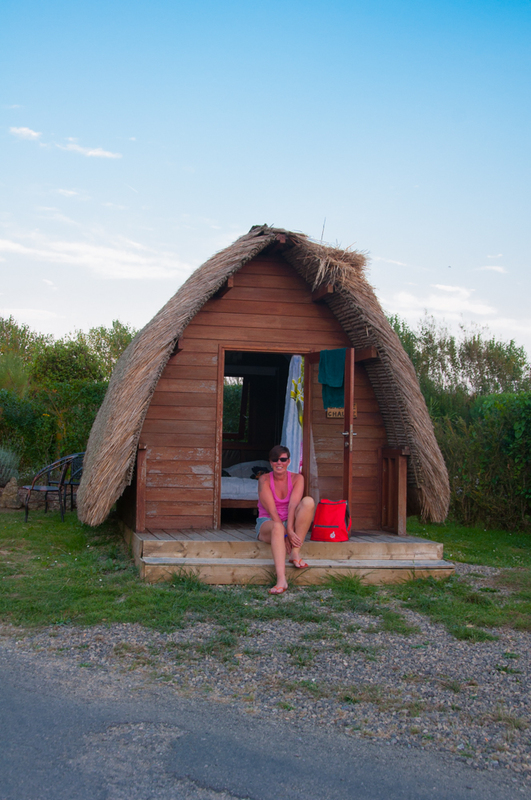 The tent stayed at home and we slept for 52 euros in a cabin, a sort of glorified garden shed with a bed in it. There is also the possibility to stay overnight in a tepee or to book a tent pitch. Provisions on the road is no problem, do not expect large supermarkets. At Wimereux is a Carrefour. The first day, despite the information I had researched it was lovely sunny, almost tropical hot. Day two there were a lot of clouds, strong winds (luckily we had the wind at your back) and a heavy shower. We walked the weekend of 27th & 28th August.